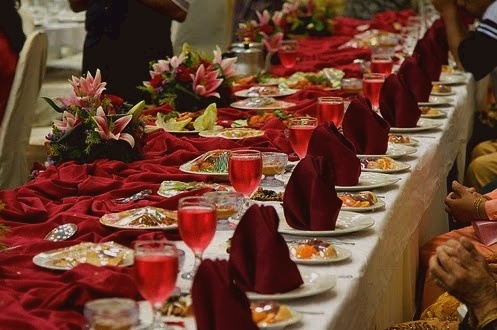 The special dishes during a Malay Wedding comprise wide variety of dishes such as Nasi Minyak, Nasi Briani, Nasi Tomato, Nasi Jaggong, Nasi Bukhari accompanied with Ayam Masak Merah, Dalcha, Mutton or Beef Briani, Pacri, Achar, Rendang and many more! At the kitchen, several women would be busy tasked with cooking large amount of rice. And among others would be charged with cutting the onions, garlics, ginger, greens and other food ingredients for the dishes. Men help setting up the tents and arrange the food tables and chairs for the guests. They also make sure that the plates and cups, glasses, forks and spoons and other utensils are clean and ready for the Big Day. And like all women, they would be chatting non-stop while doing the chores!! A few other women would be busy putting the finishing touches and decorations for the pelamin (wedding dais) and the bridal bedroomthe two most important "objects" which perhaps represent the show-case of the Wedding. hey great post! tx for these fantastic malay wedding recipe and ideas! This is such a great resource that you are providing and you give it away for free. I found this article very helpful and full of friendly budget tips about wedding decorating. Keep posting!